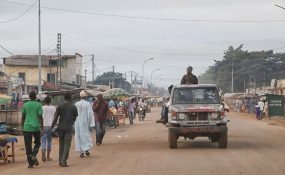 Will the Latest Central African Republic Peace Deal Hold? Khartoum — The Ambassador of the Central African Republic to Sudan, Ibrahim Abdalla, affirmed that the peace and reconciliation agreement, which was signed by the Central African Parties in Khartoum, has contributed to cessation of the war that has continued for five years in his country. discuss the regional role of Sudan in security and stability issues at the region, the Central African Ambassador said that the peace and reconciliation agreement was an important step that would have been made without the wisdom of President Omer Al-Bashir. He praised the role of the neighboring and African countries and the world in supporting peace in the Central African Republic, stressing that the role of Sudan shall be supported because it is qualified to bolster peace in Africa. The Central African Ambassador said that he sat with the heads of armed movements and felt their desire to achieve peace, affirming that the participation of the President of Central Africa Republic in the signing ceremony of the agreement in Khartoum confirms the firm desire to achieve peace.